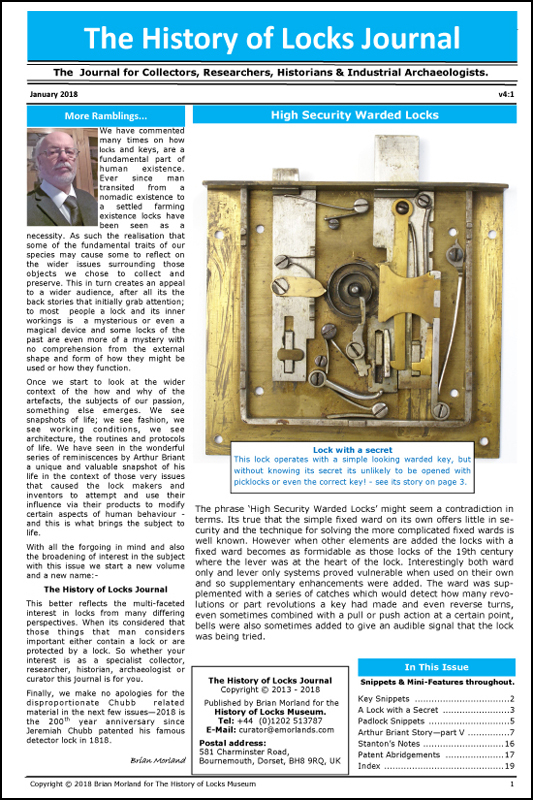 The History of Locks Museum Archive contains an index to the Chubb lock serial numbers. The index lists the year, month and day of manufacture (or completion) of Chubb locks from 1819 when production started to December 31st 1936 when the serial numbering of locks was discontinued. Post here good clear pictures of the exterior of your lock on a white plain background, which should also include a picture of the logo, marking and serial number, and one of the lock interior (except padlocks and other sealed units). Include in your post the exact dimensions (width x height x depth) and its weight. Any known provenance, where it was found, what it was used for etc. etc. The HoL Museum Team will look up the index and post the date; AL members can then 'explore' your lock and its features. As well as this thread evolving into a useful resource for all Chubb enthusiasts some pictures may also appear on the Chubb Archive website. Also would you know where I can find out a value, can’t find much on Australian eBay completed. Yes I think you are right with that number which dates it to 7th November1879. Do members have any theories on the miniature stamp on the right hand flange (Prince of Wales feathers)? I am in the possession of the safe in attached picture together with 2 original keys. Inside of the door shows info about the safe and/or lock. I have it from my grandfather who died 1969. I do not believe he bought it new. Could you provide me with more info ? Assuming your safe is cast iron, that plate would relate to the lock serial number (rather than a safe serial number) and therefore its date from the registers is 24th Oct 1836. A nice early example, I'm sure members Huw and Safeman can tell us more about these early cast iron examples. Do tell us the safe dimensions and if you have pictures of the lock inner's we can see which version of the patent it is. The letters 'A' and 'D' on these early lock plates might be significant. Thanks Brian for this interesting info and letting me join the forum. I'll post some dimensions and new pictures asap. That really would be interesting to see the mechanism considering the "New Patent" was patented in 1833. Thanks Kit, I should have spotted that, I may have looked in the wrong register. This is the period where some numbers were duplicated - just to add to the confusion and in some sections of the registers, but that's one reason we are doing all this to try and sort it all out! I have revised date which could be: 24th Oct 1836 - might become clearer once we see the actual lock. Hello again. I managed to open the inside of the door that was held by 4 bolts. I opened the lock and took some pictures. Welcome Pierre, unable to add much other than to say yours is a wonderful example and a rarity fitted with such a nice lock as most of the cast iron chests and early upright safes were more basic. Many were cast by foundries like Carron's in Scotland who made all manner of products from fireplaces, stoves, post boxes to cannons. They were fitted with (in comparison to yours) very basic box of wards, with the key directly throwing the bolts and a heavy sprung action to retain them in the thrown and withdrawn position, as opposed to the bolts operating off a proper lever lock like yours.